Alien rock formations grown from the sands of an Australian national park. 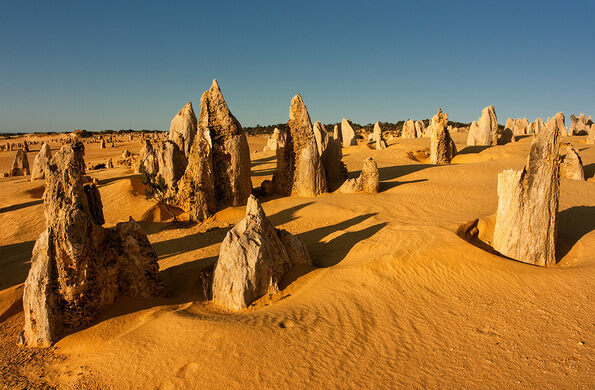 The Pinnacles are an irregular grouping of limestone towers located in coastal Australia’s Nambung National Park. These bright rocky plinths were formed slowly over millions of years as ocean winds blew small sand particles over sea shells, eventually forming lumpy limestone foundations. As the millennia drifted by the foundations grew into the crags which still exist today. Many of the pinnacles stand over 10 feet tall and are a popular attraction for tourists looking to set foot on alien soil without ever leaving the Earth. The world's "leaniest" tower encourages you to test the gravity of its situation. One of Australia's largest collections of preserved animals is on display in a historic theater. This quiet park's strange sedimentary spires were named after Kodak's color film.